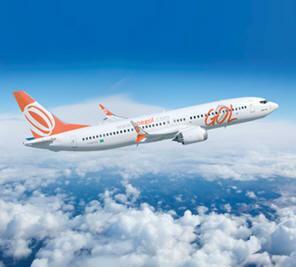 October 6, 2012 - Boeing and GOL Linhas Aereas Inteligentes announced GOL's purchase of 60 737 MAX airplanes. GOL plans to use the new super-efficient 737 MAX to increase operational efficiency and reduce costs. The order is valued at approximately $6 billion at published list prices, making it the largest order in GOL's 12-year history and the largest airplane order from a single airline in South America's aviation history. "The decision to order Boeing 737 MAX is in line with our commitment to maintain a modern and safe fleet that will allow us to sustain our competitive advantage in the long term," said Paulo Kakinoff, CEO of GOL. "The new airplanes will have one of the best cost-benefit ratios in the market due to its unique operational economy, so it is fully compatible with our low-cost model." The 737 MAX builds on the strengths of Boeing's best-selling Next-Generation 737 with big advances in fuel-efficiency and environmental performance. Equipped with new LEAP-1B engines from CFM International and improvements such as the Advanced Technology winglet, the 737 MAX reduces fuel burn and CO2 emissions by 13 percent and maintains the 8 percent operating cost advantage over future competition. This order puts the 737 MAX at 724 firm orders to date. "Boeing has partnered with GOL since their inception just over 12 years ago. We've watched them grow from a small start-up airline to a driving force in global aviation and we are proud to partner with them as the South American launch customer for the 737 MAX," said Ray Conner, president and CEO of Boeing Commercial Airplanes. "The unmatched operating economics of the 737 MAX make it the absolute best airplane for the world's low-cost carriers and legacy carriers alike. GOL's commitment to the MAX proves this once again." In just more than 11 years, GOL has established itself as one of the fastest growing low-cost, low-fare airlines in the world. GOL currently offers the most extensive and convenient routes in South America with approximately 810 daily flights to 63 destinations in Brazil and 12 in South America and the Caribbean. Combined with six code-share partnerships and more than 60 interline agreements with foreign companies, GOL's route network is among the best serving customers traveling to, from and within Brazil.